Where La Jolla Zip Zoom zip line begin. Think rainforest canopy, or raging river below, Hawaii and Puerto Vallerta. How about Rotorua and Queensland, New Zealand and Rixos, Turkey? Then, think rubber tire tubes and the La Jolla Indian Campground. Tthese long pulleys suspended on cables propelling people by gravity to the bottom of an incline made its way all the way to Pauma Valley last September. 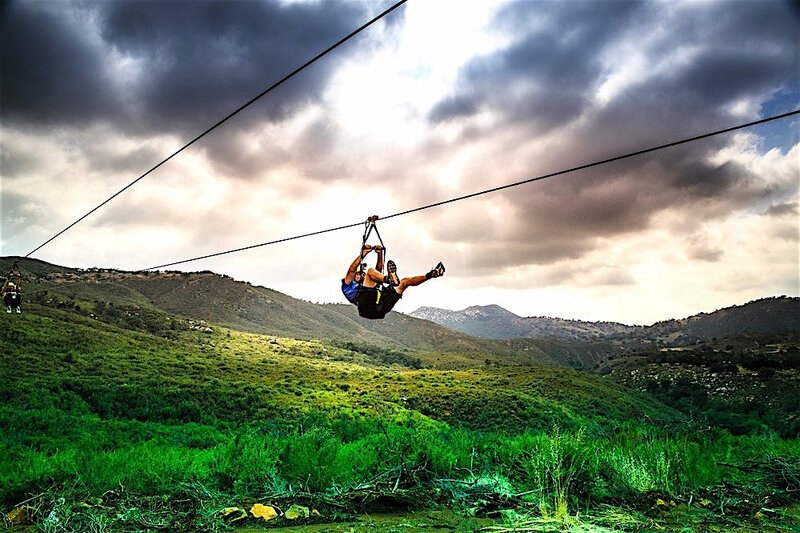 For $99 a drop, all who want to get a zip-line-eye’s view of “mountain peaks, lush green canyons and rustic steep slopes of the La Jolla Band of Luiseno Indians reservation. La Jolla Campground’s line zips along a 6,273-foot course running parallel to the San Luis Rey River. This trip offers views of the 4,000-to-6,000 foot peaks of the Palomar Mountain Range traversing steep slopes ad “bottomless” green valleys. “The whole tour takes about two hours and consists of four zip lines,” Self-proclaimed “adrenaline junky” Sanna Coates said. “The first one is the tallest and fastest, launching from 3,000 feet and reaching speeds of up to 55 miles per hour. There’s normally a short hike from one tower to the next, but with temperatures reaching the mid-90s, we got to jump back on the truck instead. “Before releasing the safety wires that kept us on the platform, Jungle Joe encouraged us to “learn how to fly,’ Coates said. “This meant letting go of the handle and having some fun. Putting one arm out will make you spin, and putting both arms and legs out, in a move known as “the starfish,” will make you slow down. Meanwhile, dropping down to the San Luis Rey River. 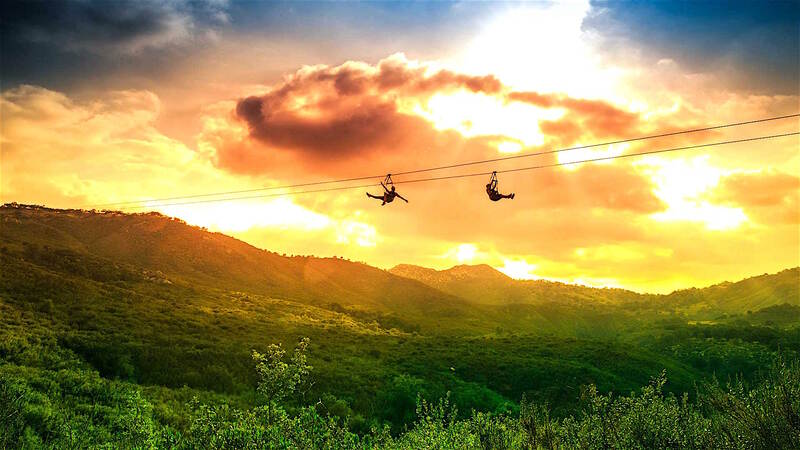 La Jolla Campground is the latest Zoom branded locations with the aforementioned New Zealand venues along with a zip line experience in New Jersey and West Virginia. Zip line tours generally take about two hours. While they cost $99, campers pay $75 and special rates are available for groups. Parking is $15, which also allows for use of the campgrounds. Age is no problem but height and weight might be. Zip-liners must weigh between 65 to 275 pounds and be four feet tall. Parents or guardians must sign waivers for children to participate and accompany their kids at all times. Pregnant woman and those on alcohol or drugs shouldn’t be riding, yo. Helmets come with the gig with the harness and trolley inspected before each ride. Full safety orientations are given before tours embark. Guides accompany all tours. Zip liners are attached to a full body harness secured to an inclined steel cable. With side-by-side lines, riders can go down in tandem. “After safety training, riders are transported to the highest tower for the second run,” publicists said. “Along the way, there’s spectacular views of the reservation’s amazing topography, and a chance to learn the history of the area. “The launch for the second run is from 3,000 feet in elevation. Riders soar 2,500 feet across treetops and canyons at speeds that can reach up to 50 miles per hour. There’s a short nature hike through the oaks to the third tower and another ride of 1,430 feet. La Jolla Zip Zoom is open 8 a.m. to 6 p.m. although times and days may vary depending on weather or season. It’s at 22000 Highway 76, Pauma Valley. For more information, visit http://www.lajollazipzoom.com or call (760) 742-3776. Be the first to comment on "Zip, zip and away at La Jolla Zip Zoom"